Delighted Momma: Boy or Girl? Plus the worst cake possibly ever made. CONGRATULATIONS! How exciting for Max to have a brother! That'll be fantastic! yay! congrats on another little boy - how exciting! Who cares how the cake turns out when there is such good news to focus on instead :) I actually LOVED that you could see the blue so well spilling over in the first picture because I could tell right away that you were having a BOY! Haha. So exciting! I think it's wonderful no matter what you end up with BUT there is something special about the relationship between brothers! Congrats, that is wonderful news! I am sure Max is excited!! Yay! Congrats. Health and happiness to you!! Congratulations Lindsay! How wonderful that Max will have a the joy of a brother of in his life. My husband's brother came home for Christmas (he live out of state) and my husband is so happy. LOL Lindsay! That's so funny. Congratulations my love! Congrats! Baby boys are wonderful. :) I can so relate on the baking fail. I love to cook and usually luck out when throwing something together, but I can not pull off a successful baked good for anything. Haha. omg so funny!!! my mom swears that you are either a good cook or a good baker. She can cook, I can bake. Neither of us can do the other!! Yay! Congratulations. And I say you're the best cake-baker ever because you were so creative you found a cute way to save those spilled over cakes! I'm so happy for you! love it!!! i'd eat that covered with sprinkles and icing! congrats on your newest addition! congrats on your little boy! it's always so fun and exciting to find out what is growing inside you! Congratulations Linds! I bet Max is so pumped to have a little brother! I think the cakes are adorable, and I bet no one even cared! : ) A baby boy? What a special gift! Congrats to you and yours family! Oh my gosh congrats! How exciting! And you crack me up with your cake skills. Sounds like me but with cooking in general, however I can do cake box mixes lol. I'm trying not to laugh. Really I am. Congrats on the Baby Boy! Your cakes turned out cute :) Our baby is due June 9th...but I don't find out until January 19th! I don't know if I can wait that long, may have to go to a 3D ultra sound place. Yay! You will love having two of the same gender close together. They will be best friends! Congrats friend! I am so happy for you! Woohoo! Another boy! Saves you a lot of money Linds right? Congratulations to you and Ian, Max is going to love having a little brother. Oh, and we will just leave the baking up to Aunt Cindy, I am the same as you, can't even bake a box cake! yay!!! how exciting! i have two nephews and they are the BEST!! so fun!!! congrats, girlie! Hahaha awwww I love your efforts for trying. Congratulations on your little man!!! Aww. I love this on many levels. Woo hoo boy!! The only thing I'm good at is making cake. (tip - under cook by a couple minutes. it always turns out better…and more moist.) You'll get the hang of it! Maybe cupcakes would be a good practice? :) But, I think the cake looks delicious. 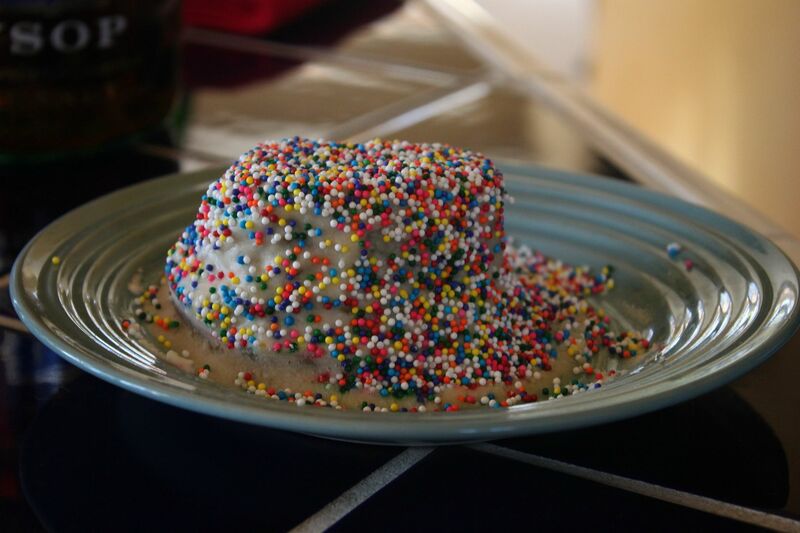 Sprinkles make everything better. haha! Congrats anyways! That's so exciting! aww congratulations!! looks yummy none the less! love your biscuit and gravy looking cake. haha. congratulations on baby boy!! Congrats on the little man! It def makes for a fun telling story! YAY!!! What a cute idea! I'm with Antoinette, if everything goes perfectly, then there are no great stories to share and laugh about :) Congratulations on your baby boy!!!!! TOTALLY laughing out loud at your cake stories and CONGRATULATIONS on baby boy!!!!!! YAY!!!! and i think the cakes turned out perfect! haha the sprinkles are so fun!! Congrats little boys are awesome !!!! :))) thanks for visiting my blog & I wish you the best throughout your pregnancy ! hehe...thanks for being so honestly cute cakes, as long as they taste good, who cares. Congrats on having baby boy yay! 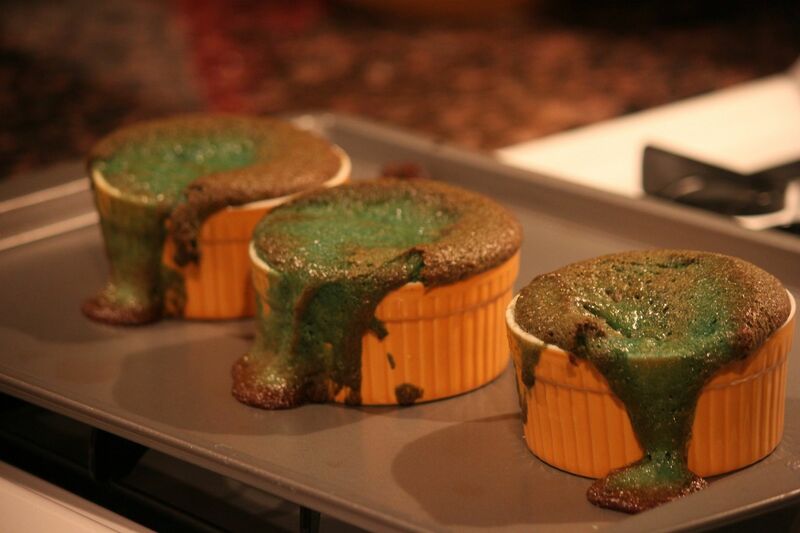 By the way, the pics of the green melting cakes made me think for a second you were having a baby Shrek, phew! Congratulations! And yes, Grandparents don't care what the cake looks like when they have a grandbaby in the making! Congrats!!!! I love your blog!!! OMG congrats on the little boy on the way!! So so exciting Lindsay!! congratulations! i love junebugs (i have two). 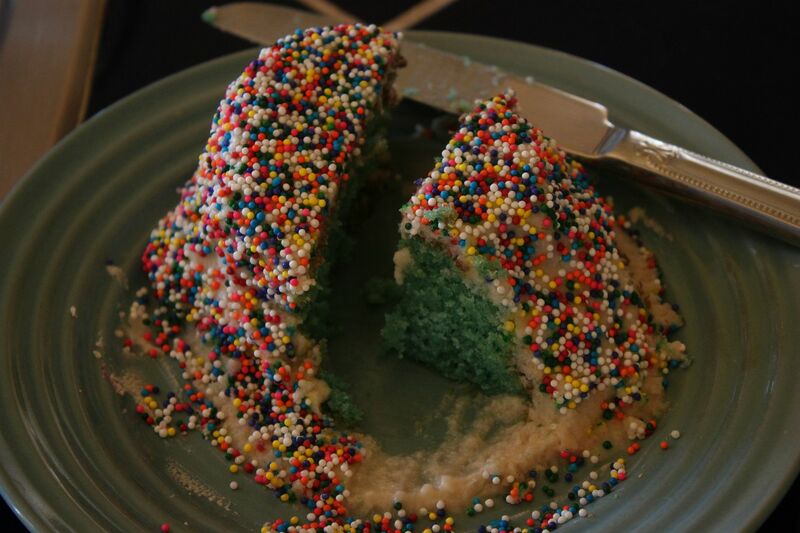 and i'm so glad i'm not the only blogger who can't make a cake. love your new toms too. wishing you a happy new year! Oh my word you crack me UP! Hahaha but CONGRATS!!! Ah! Congrats!!! I LOVE this!! !